I recently asked some of my friends what they thought was the most iconic car in history, and perhaps unsurprisingly, many of them answered with the Volkswagen Golf MKI GTI. Maybe I asked the wrong people, because all of them are VW minded and drive similar cars like this one! But the Golf MKI GTI is certainly an iconic car in its own right. 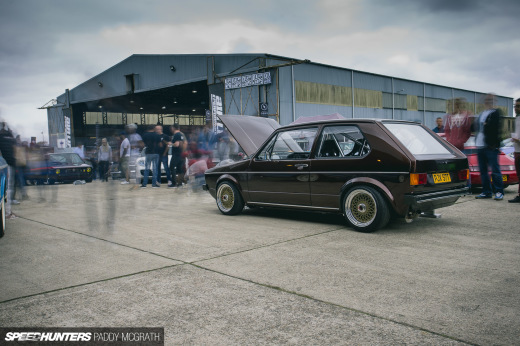 This car was one of the first hot hatches and is continuing to gain popularity as a project car. However, despite its large production numbers, finding an unmolested example is no easy feat. 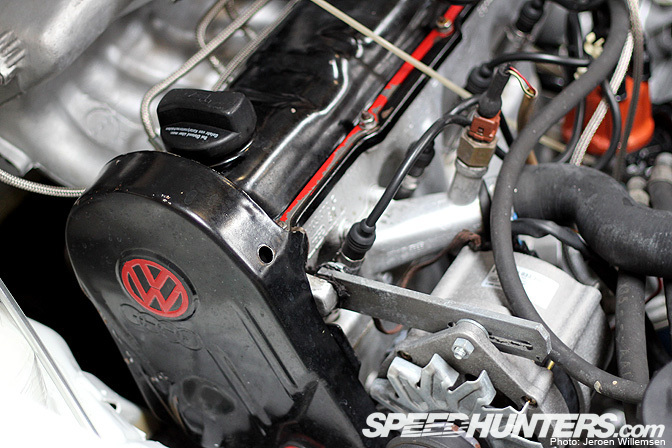 That didn't stop the owner of this car, Tim Verbeek, from searching tirelessly for a GTI he could work his magic on. He wanted a car that was as close to stock as possible which he would then restore with all original parts and moldings. Tim did add some parts that weren't original just to spice things up a little. Like the xenon bulbs inside the headlights. These taillights are also aftermarket items -just to give the rear a more modern touch. The car has been lowered using FK coilovers. It isn't set up to be ultra-slammed because the village Tim lives in has a lot of speed bumps. What would a Golf GTI be without a nice set of BBS rims? It is almost mandatory, so Tim did the right thing and ordered a set of BBS RM in 15×8-inch. Power comes from the original 1.6 liter 8V. It generates a very nice burble through a stainless steel exhaust. 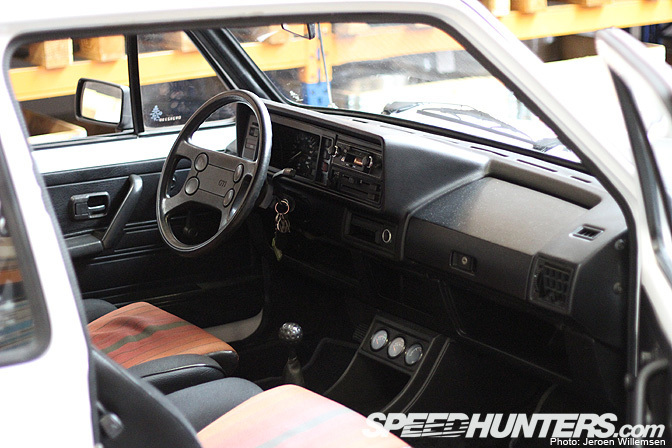 The interior is completely stock except for the VDO gauges on the middle console. Here's a detail that is sometimes overlooked. A brand new modern radio would look totally out of place. so it was cool to see this old one – which still functions – left in its place. I got the chance to drive this car back to Tim's garage and I must say, it really brought a smile to my face. I just love these older generation cars as they have so much more character that newer cars seem to lack. Now that I've shown you Tim's street car, we'll shortly reveal another of his cars that fits our Sleepers theme. Great car, great rims, great everything... but those taillights just look tacky as hell. Loose the taillights and Xenon rubbish, then it's awesome. The vdo gauges in the center console are stock in gti's and cabriolets. 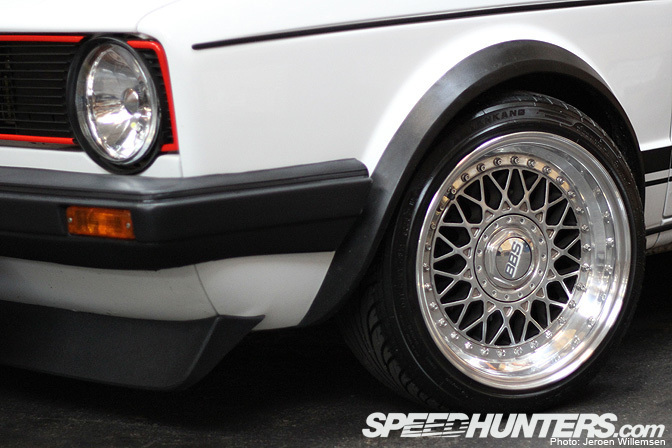 "What would a Golf GTI be without a nice set of BBS rims?" Original, interesting, and not hopelessly overdone come to mind. C'mon. Yes, that special character that older cars posses is gone from today's cars. It makes me glad to see that there are people who have a thing for these older cars, even though im not that big of a fan of Vw's but i can appreciate this gti. U will get shot for tail lights like those down in Cape Town hehehe. I was hoping for another mad sleeper. I guess it's an ok car though. This thing is perfect! great location as well! i dont get it. why is this car beeing reviewed? 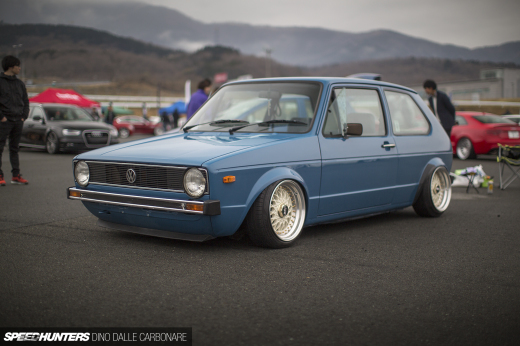 yay another VW on BBS wheels!!! Nice car is this shoot at VMC? All that time, money, and effort to build this, and then he couldn't buy good tires for it? This car deserves better than Nankangs. @Chrisbmx68 I was going to say the same thing. 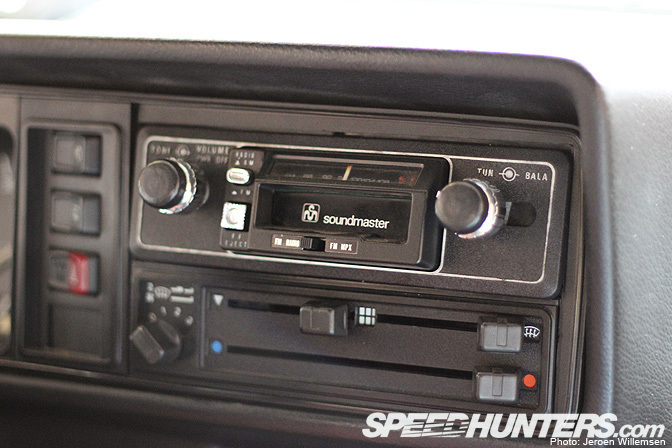 It should read "The interior is completely stock, including the VDO gauges on the middle console." Perfect and nice car. I agree this MkI was and still will be iconic car. What I don't get is why many people put so much effort into making beatiful car and than put chinese tires on it. agree, headlights and taillights are rubbish, stock all the way. Put the original lights on it and it´s perfekt! Shame about the tail lights and wheels..
can the BBS RM/RS still can be 'ordered' brand new? Nice picture, but the model seems to be remake of Maruti Suzuki 800.